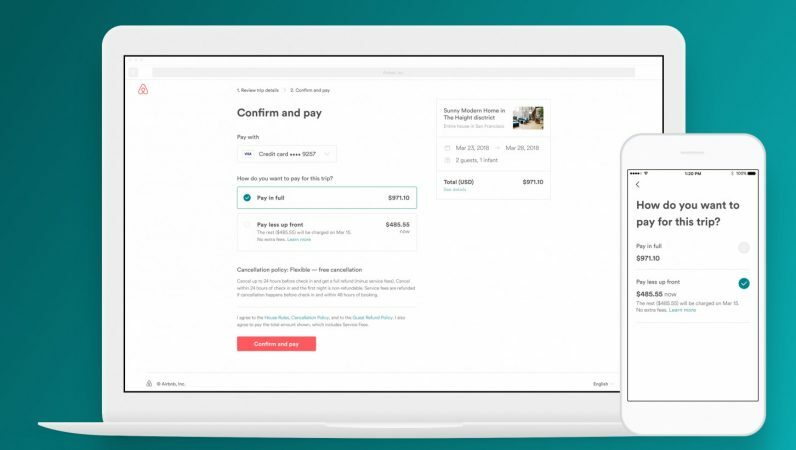 Airbnb is rolling out a new feature called Pay Less Up Front. No prizes for guessing what it does. It (shockingly) lets you stagger the bill for your accommodation. Not every rental is eligible for Pay Less Up Front. The total value has to be at least $250, making this only really an option for those staying in higher-end properties, or taking trips that last several days. You also have to book at least two weeks in advance. For advance bookings, that’s not an issue. But if you’re looking for something spur of the moment, you’ll have to pay the full whack upfront. Airbnb has been trialling this for some time. In their limited trials, 40 percent of guests chose to use the service. The housesharing company says that those who split their payments tended to spend more on bookings, which makes sense. It also noted that people tended to make bookings further in advance. Pay Less Up Front — or rather, the idea of splitting a big-ticket purchase into smaller, more easily-digestable payments — isn’t exactly novel. Credit cards, for example, have existed for ages. Some hotel sites let you pay for your booking at check-in, which gives you time to squirrel money aside for the cost. And at the lower-end of the scale, HostelWorld lets you pay as much as twenty percent upfront, with the rest due when you arrive. However, it’s nice to see something baked into the heart of Airbnb. And it’s nice to see that the company is addressing the wants of its users, when it comes to payments. At the end of November, the company introduced group payments, which was an item on traveler’s wish-lists for some time.